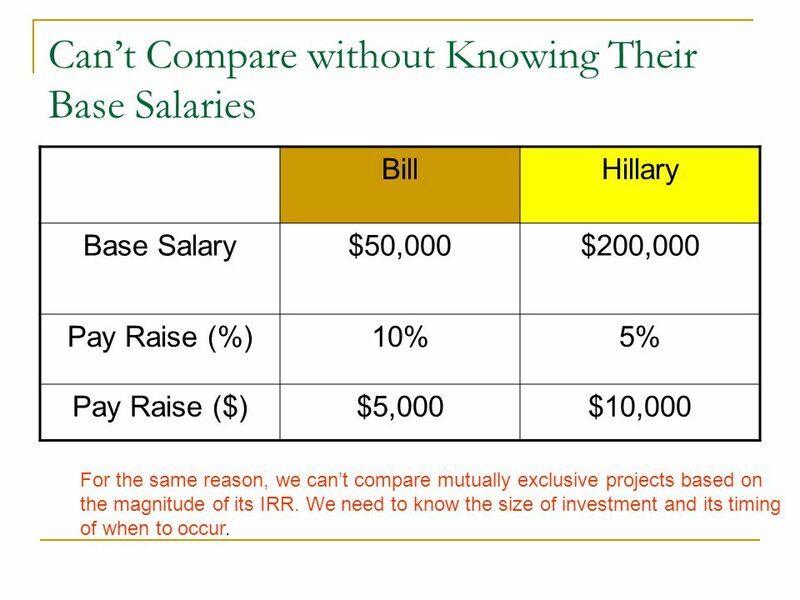 Bill Hillary Base Salary $50,000 $200,000 Pay Raise (%) 10% 5% Pay Raise ($) $5,000 $10,000 For the same reason, we can’t compare mutually exclusive projects based on the magnitude of its IRR. We need to know the size of investment and its timing of when to occur. 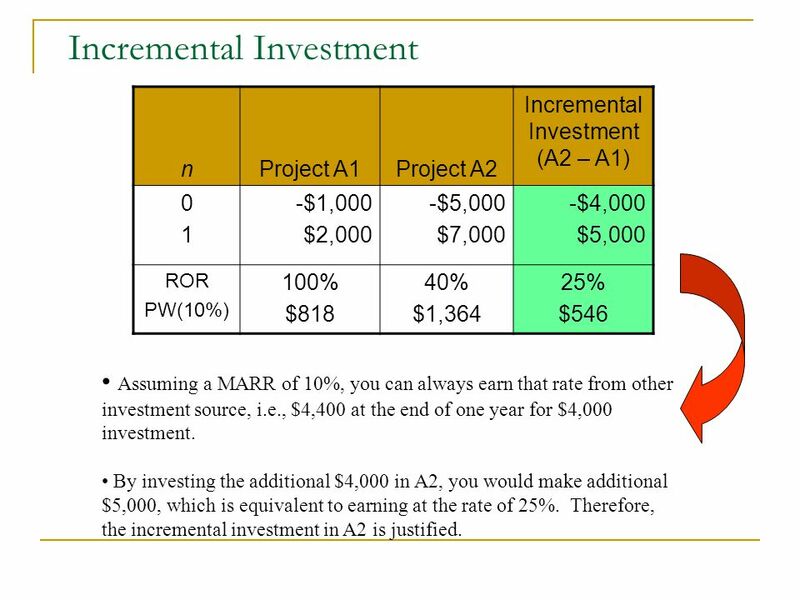 Project A1 Project A2 Incremental Investment (A2 – A1) 1 -$1,000 $2,000 -$5,000 $7,000 -$4,000 $5,000 ROR PW(10%) 100% $818 40% $1,364 25% $546 Assuming a MARR of 10%, you can always earn that rate from other investment source, i.e., $4,400 at the end of one year for $4,000 investment. By investing the additional $4,000 in A2, you would make additional $5,000, which is equivalent to earning at the rate of 25%. Therefore, the incremental investment in A2 is justified. 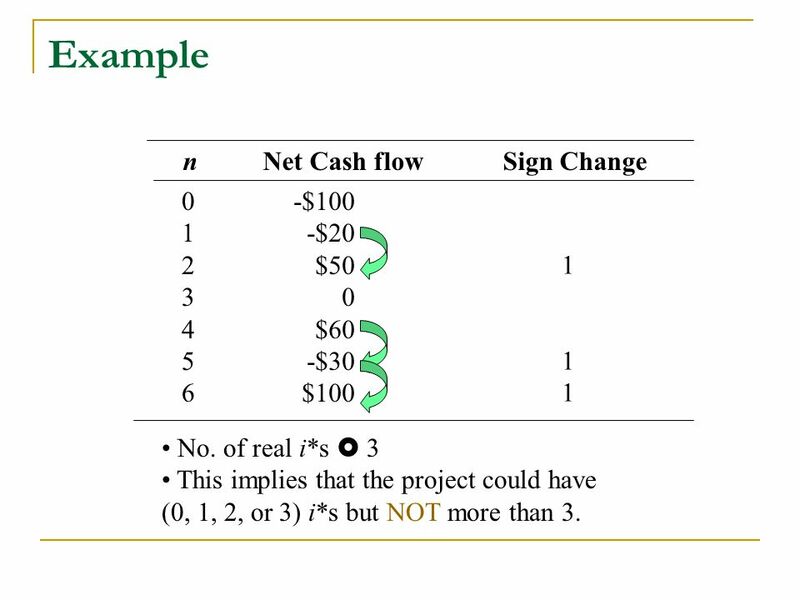 Step 1:	Compute the cash flow for the difference between the projects (A,B) by subtracting the cash flow of the lower investment cost project (A) from that of the higher investment cost project (B). 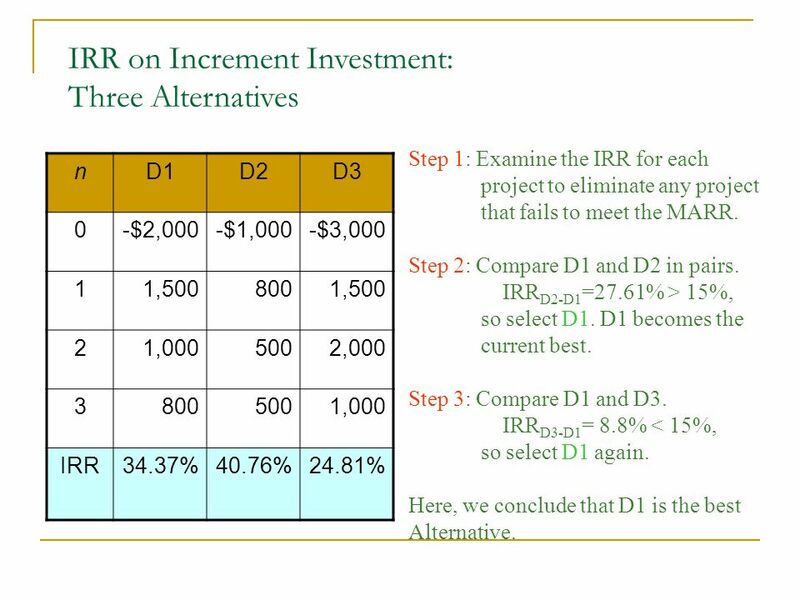 Step 2:	Compute the IRR on this incremental investment (IRR ). 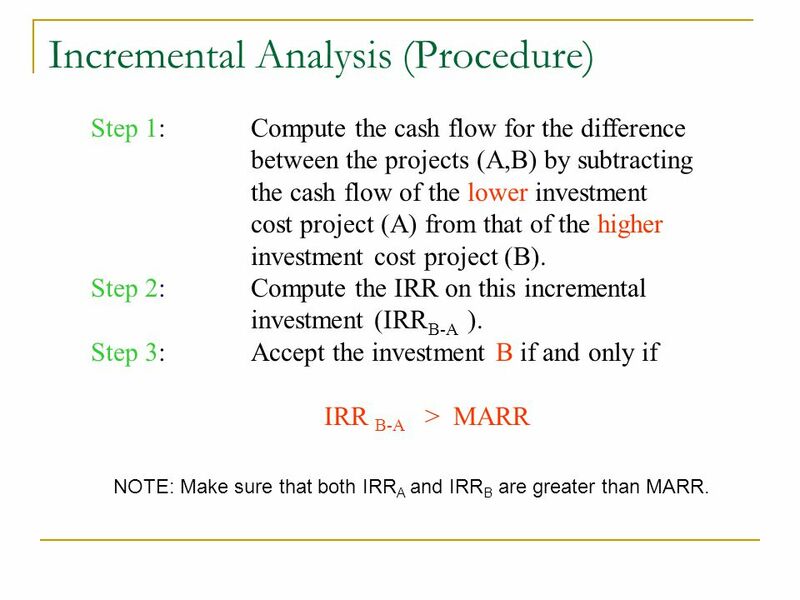 Step 3:	Accept the investment B if and only if IRR B-A > MARR B-A NOTE: Make sure that both IRRA and IRRB are greater than MARR. B1 B2 B2 - B1 1 2 3 -$3,000 1,350 1,800 1,500 -$12,000 4,200 6,225 6,330 -$9,000 2,850 4,425 4,830 IRR 25% 17.43% 15% Given MARR = 10%, which project is a better choice? 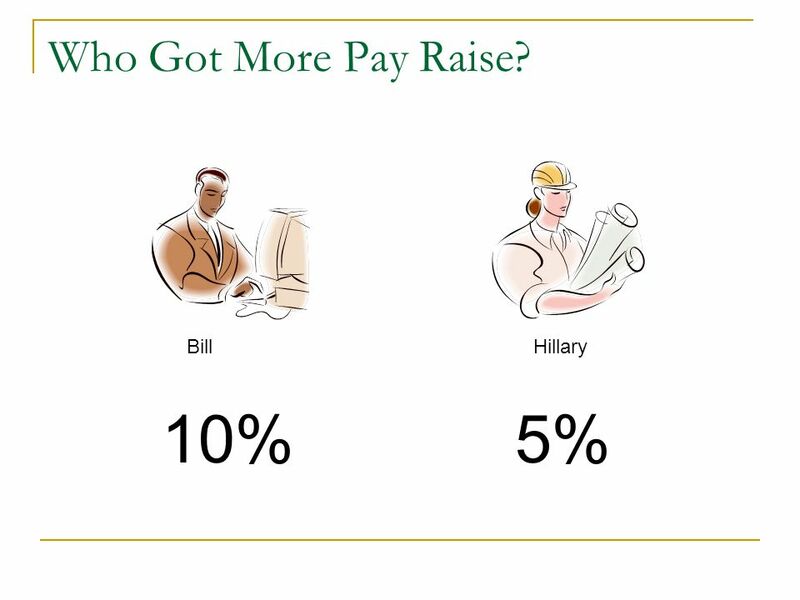 Since IRRB2-B1=15% > 10%, and also IRRB2 > 10%, select B2. 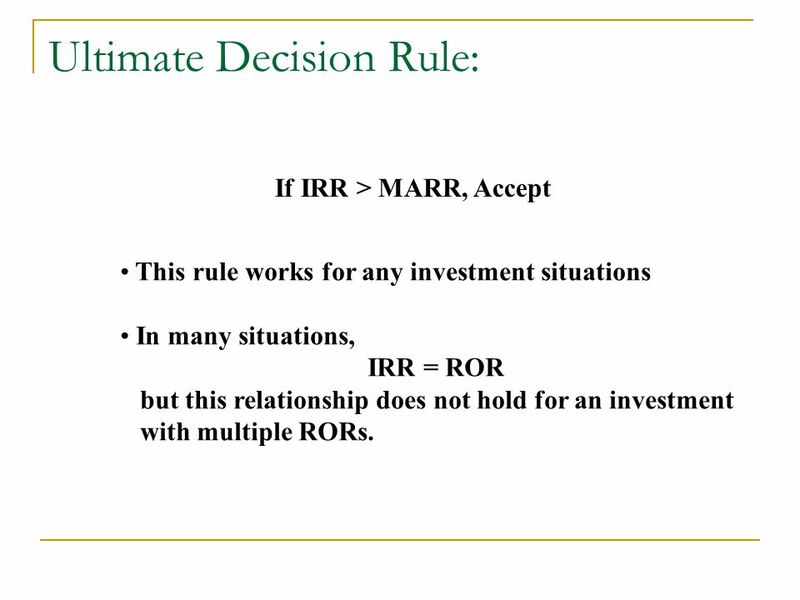 If IRR > MARR, Accept This rule works for any investment situations In many situations, IRR = ROR but this relationship does not hold for an investment with multiple RORs. 1 2 3 4 5 6 -$100 -$20 $50 $60 -$30 $100 1 No. of real i*s  3 This implies that the project could have (0, 1, 2, or 3) i*s but NOT more than 3. 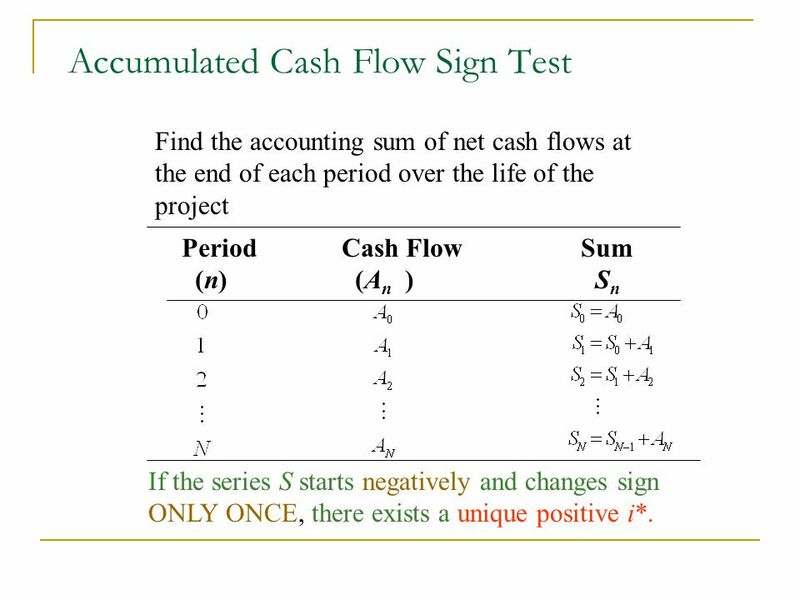 Find the accounting sum of net cash flows at the end of each period over the life of the project Period	Cash Flow Sum (n)	(An )	Sn If the series S starts negatively and changes sign ONLY ONCE, there exists a unique positive i*. 18 Example A.2 $3,900 $2,145 $1,000 $5,030 Is this a simple investment? 1 3 $1,000 $5,030 Is this a simple investment? 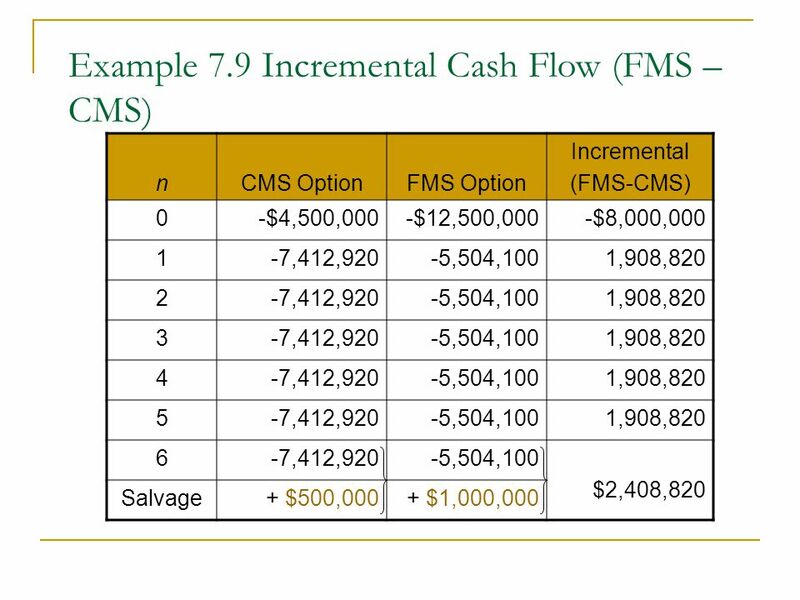 How many RORs (i*s) can you expect from examining the cash flows? Can you tell whether or not this investment has a unique rate of return? 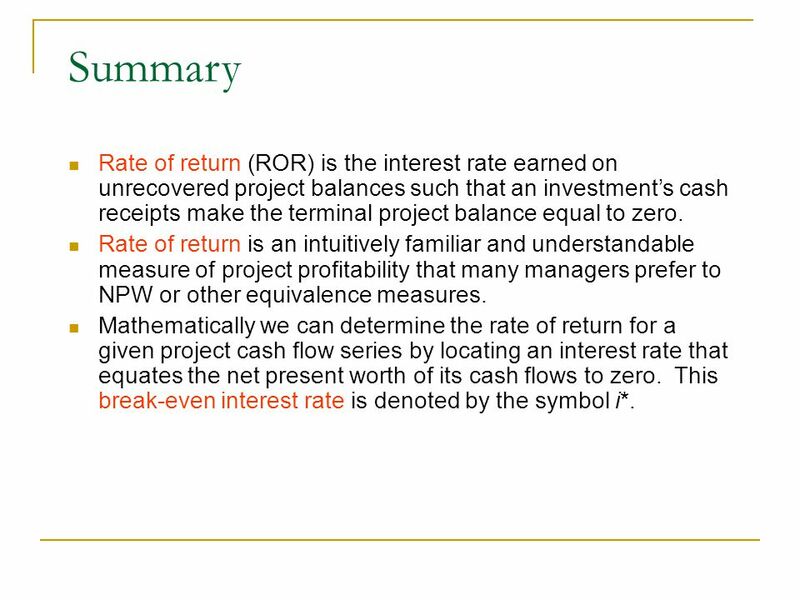 19 Summary Rate of return (ROR) is the interest rate earned on unrecovered project balances such that an investment’s cash receipts make the terminal project balance equal to zero. 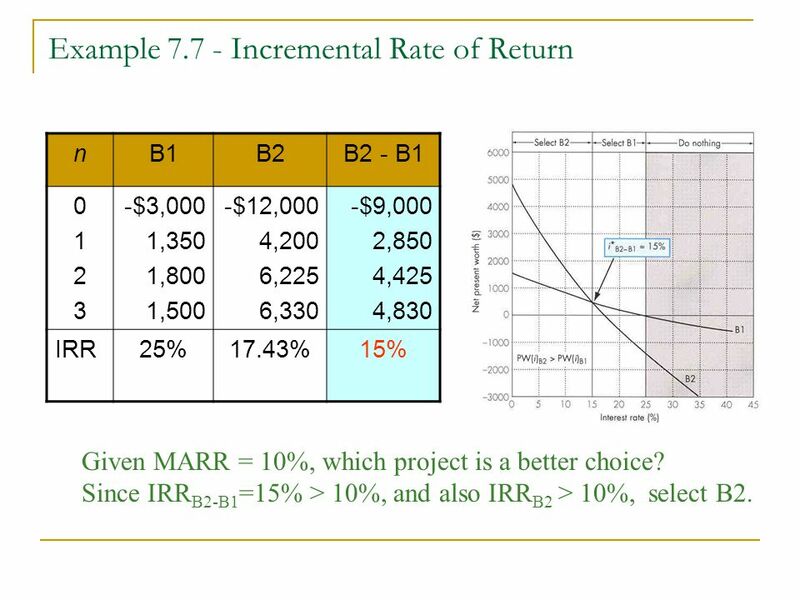 Rate of return is an intuitively familiar and understandable measure of project profitability that many managers prefer to NPW or other equivalence measures. 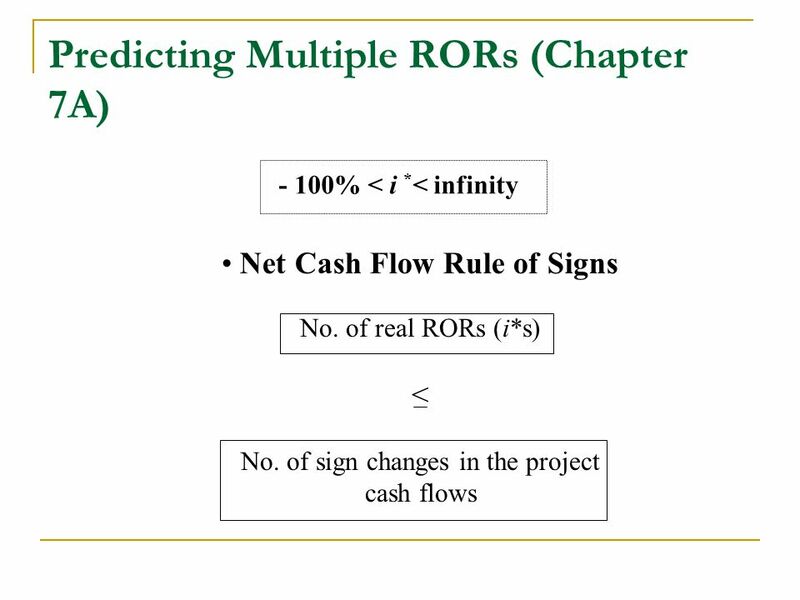 Mathematically we can determine the rate of return for a given project cash flow series by locating an interest rate that equates the net present worth of its cash flows to zero. This break-even interest rate is denoted by the symbol i*. 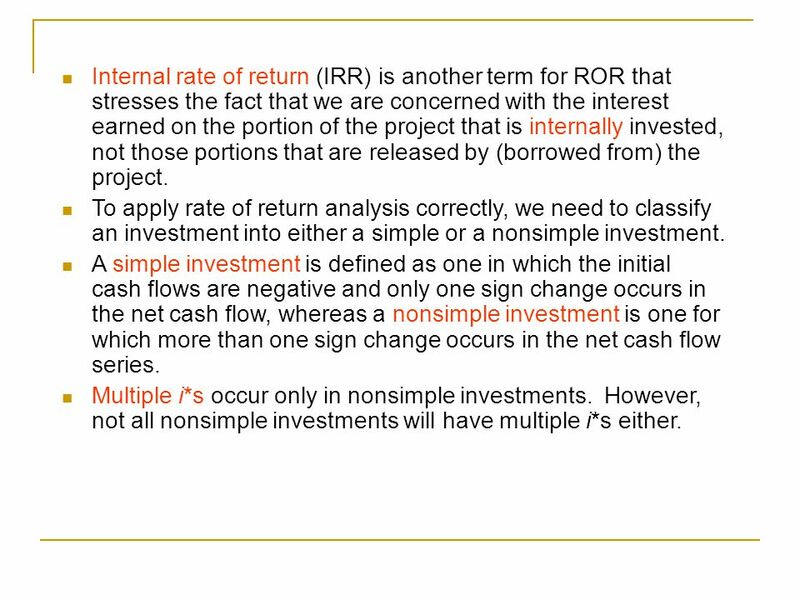 20 Internal rate of return (IRR) is another term for ROR that stresses the fact that we are concerned with the interest earned on the portion of the project that is internally invested, not those portions that are released by (borrowed from) the project. To apply rate of return analysis correctly, we need to classify an investment into either a simple or a nonsimple investment. 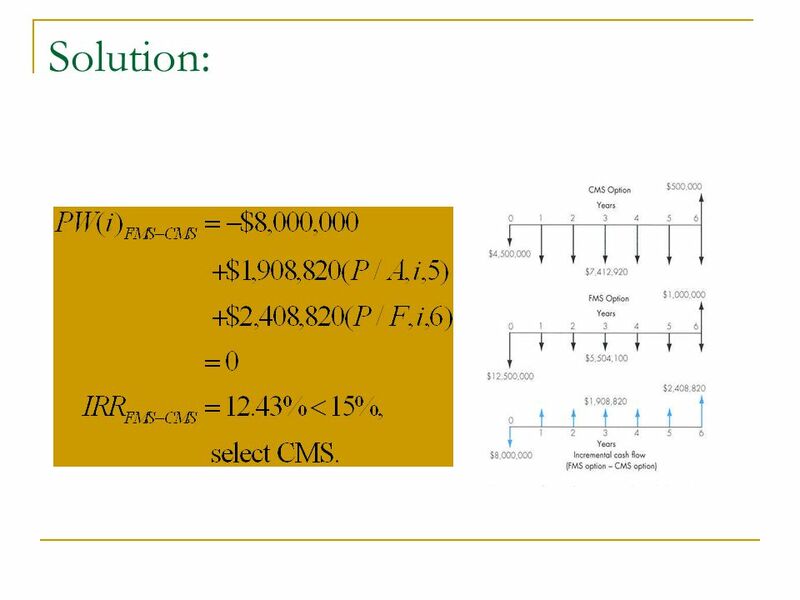 A simple investment is defined as one in which the initial cash flows are negative and only one sign change occurs in the net cash flow, whereas a nonsimple investment is one for which more than one sign change occurs in the net cash flow series. Multiple i*s occur only in nonsimple investments. However, not all nonsimple investments will have multiple i*s either. 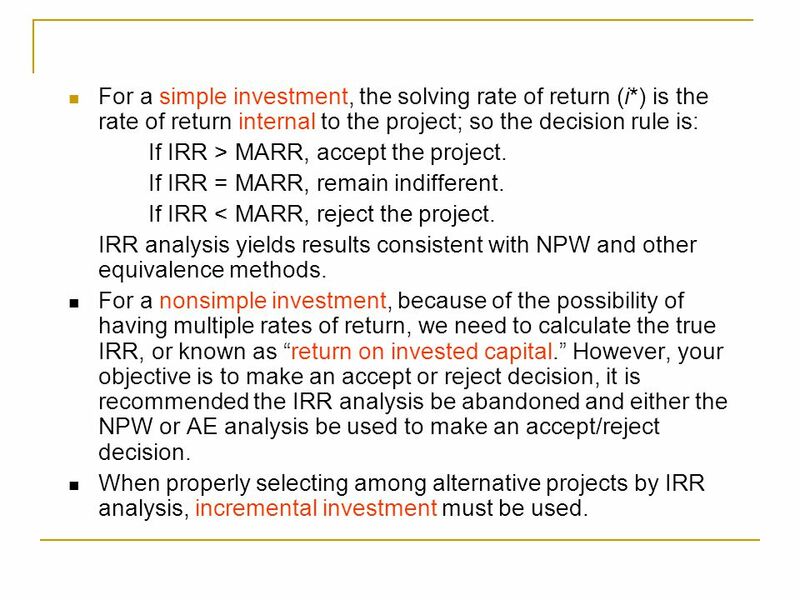 For a simple investment, the solving rate of return (i*) is the rate of return internal to the project; so the decision rule is: If IRR > MARR, accept the project. If IRR = MARR, remain indifferent. If IRR < MARR, reject the project. IRR analysis yields results consistent with NPW and other equivalence methods. 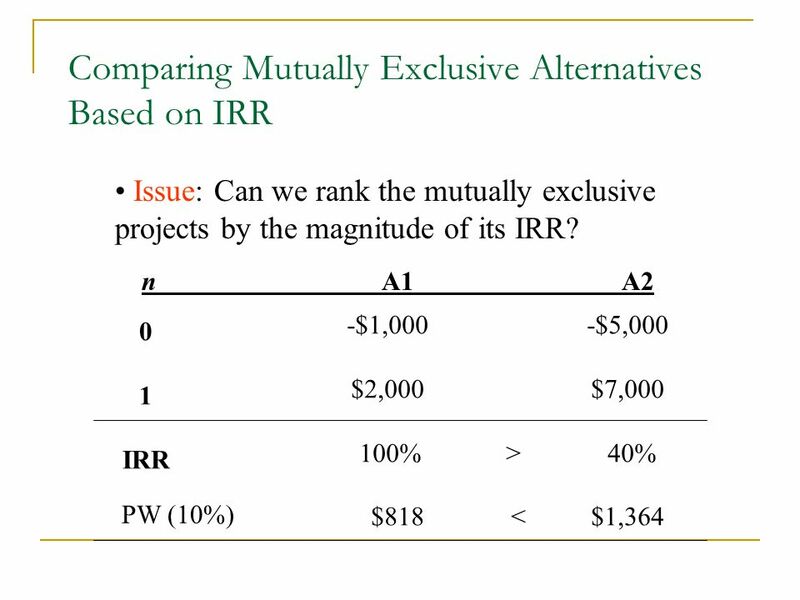 For a nonsimple investment, because of the possibility of having multiple rates of return, we need to calculate the true IRR, or known as “return on invested capital.” However, your objective is to make an accept or reject decision, it is recommended the IRR analysis be abandoned and either the NPW or AE analysis be used to make an accept/reject decision. 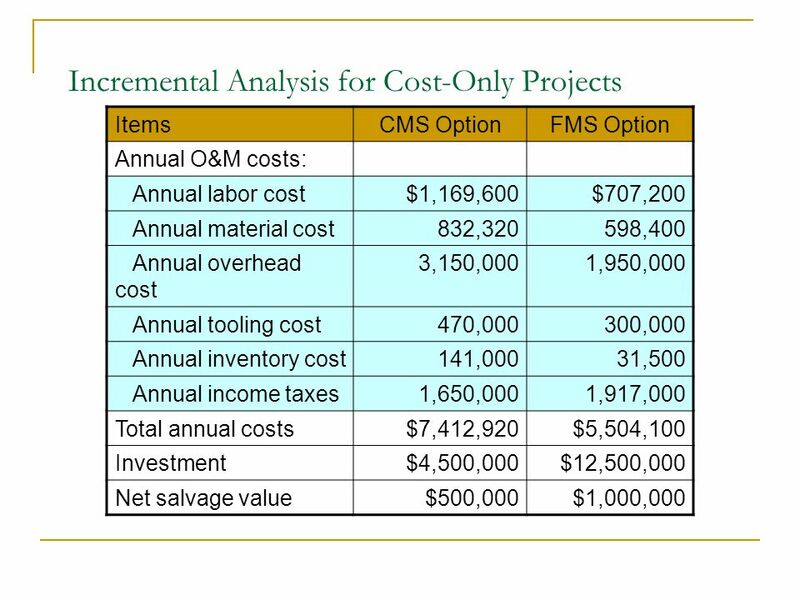 When properly selecting among alternative projects by IRR analysis, incremental investment must be used. Download ppt "Incremental Analysis Lecture No. 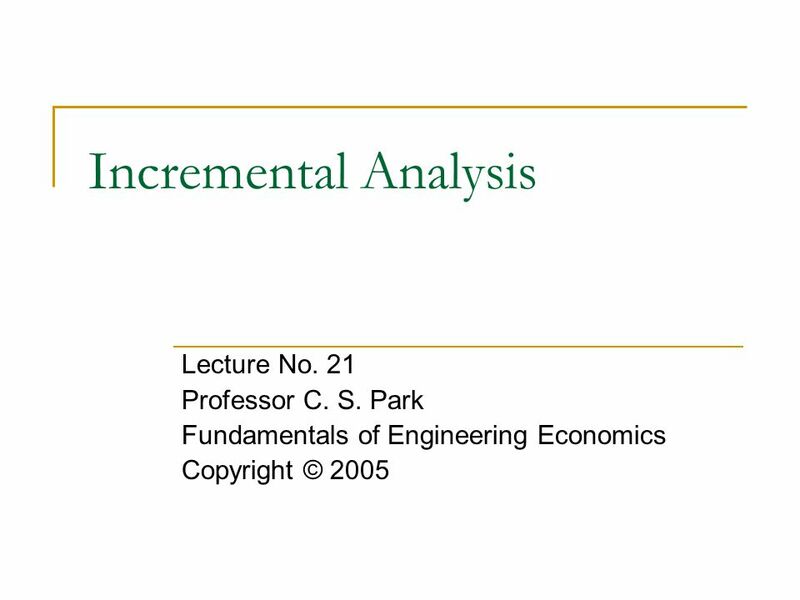 21 Professor C. S. Park"
Contemporary Engineering Economics, 4 th edition, © 2007 Incremental Analysis Lecture No. 28 Chapter 7 Contemporary Engineering Economics Copyright © 2006. Lecture No. 23 Chapter 7 Contemporary Engineering Economics Copyright © 2010 Contemporary Engineering Economics, 5 th edition, © 2010. Evaluating Business and Engineering Assets Payback Period. 1 Project Cash Flow Analysis Lecture No. 27 Professor C. S. Park Fundamentals of Engineering Economics Copyright © 2005. Comparison Methods Part 2. Copyright © 2006 Pearson Education Canada Inc Introduction Chapter 4 introduced the Present Worth and Annual Worth. 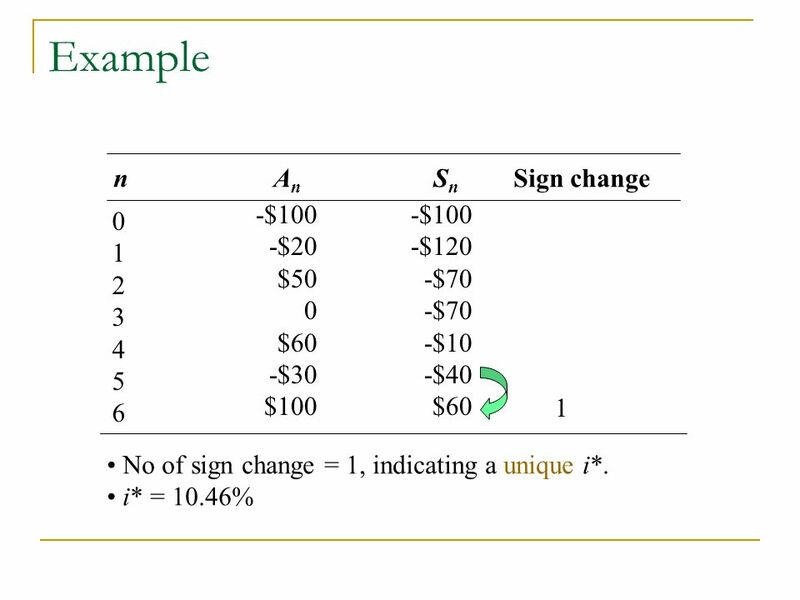 Chapter 7 - Rate of Return Analysis Click here for Streaming Audio To Accompany Presentation (optional) Click here for Streaming Audio To Accompany Presentation. Internal Rate of Return (Multiple Rates of Return Problem) ECON 320 Engineering Economics Mahmut Ali GOKCE Industrial Systems Engineering. Engineering Economic Analysis - Ninth Edition Newnan/Eschenbach/Lavelle Copyright 2004 by Oxford University Press, Inc.1 Engineering Economic Analysis. (c) 2001 Contemporary Engineering Economics 1 Chapter 9 Rate of Return Analysis Rate of Return Methods for Finding ROR Internal Rate of Return (IRR) Criterion. Flash back before we compare mutually exclusive alternatives. 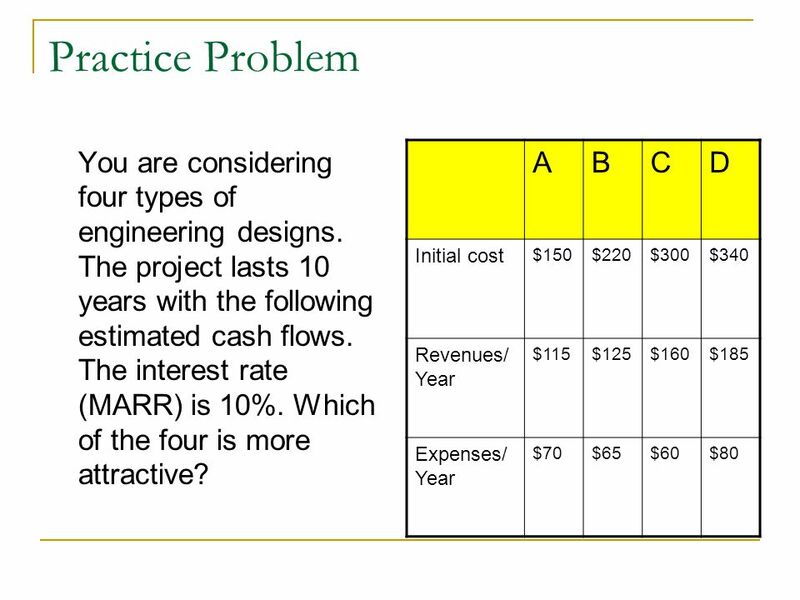 Contemporary Engineering Economics, 4 th edition, © 2007 Choice of MARR Lecture No. 62 Chapter 15 Contemporary Engineering Economics Copyright © 2006. 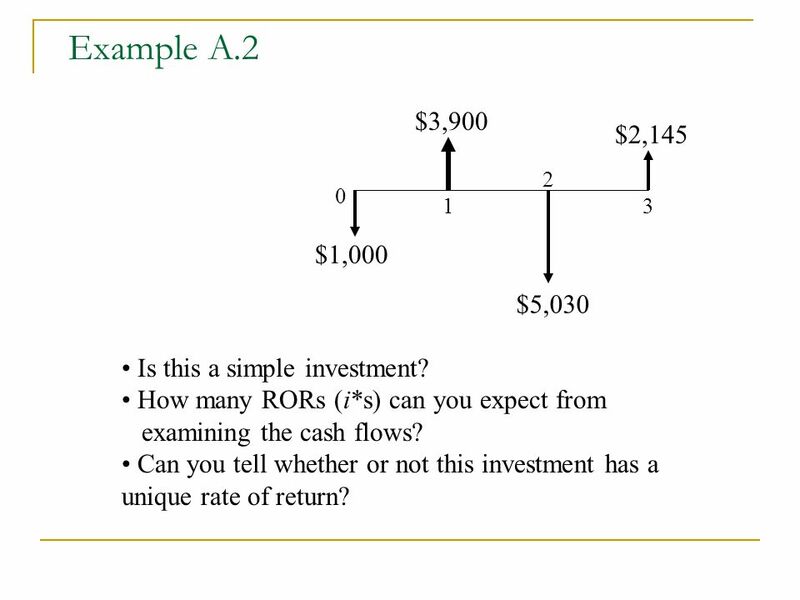 Internal Rate of Return (Multiple Rates of Return Problem) Lecture No. 20 Professor C. S. Park Fundamentals of Engineering Economics Copyright © 2005. Contemporary Engineering Economics, 6 th edition Park Copyright © 2016 by Pearson Education, Inc. All Rights Reserved Process of Developing Project Cash.